MCALLEN, Texas (CNS) — Three years ago, a humanitarian crisis engulfed the city of McAllen as tens of thousands of asylum seekers from Central American countries entered the border city — often arriving exhausted and traumatized from the long journey north. Many of them were fleeing extreme violence and poverty in their home countries of Honduras, El Salvador and Guatemala. Sister Norma Pimentel, a member of the Missionaries of Jesus, who is executive director of Catholic Charities of the Rio Grande Valley, recognized the need to help the refugees — mostly unaccompanied children and women with children — who were pouring into the city on their way to meet family members in other parts of the United States to seek political asylum. She approached Sacred Heart Church in McAllen about using its parish hall for a few months to create a waystation for these asylum seekers to get a shower, fresh clothes, and supplies for infants and children. Three years later, the Humanitarian Respite Center has served 74,000 people — and the parish is finally getting its hall back. A new building one block from Sacred Heart Church will be constructed to house the respite center, thanks in part to a $100,000 grant from nonprofit Catholic Extension presented by Cardinal Blase J. Cupich of Chicago, who is chancellor of Catholic Extension. The Chicago-based organization is the leading national supporter of missionary work in poor and remote parts of the United States. Cardinal Cupich traveled to McAllen to officially grant $100,000 to the Diocese of Brownsville for the construction of the new building. The funds were raised at a benefit dinner at the Vatican Museum organized by Catholic Extension on the day of the Chicago prelate’s elevation to the College of Cardinals in November 2016. Standing at the future site of the new facility after Mass, Cardinal Cupich presented a plaque to Sister Pimentel and Bishop Daniel Flores of the Diocese of Brownsville, commemorating the occasion. “I accept this gift from Catholic Extension and Cardinal Cupich as being very much a part of this great venture, which is our common venture in the Church of giving witness to Christ, especially in the most vulnerable,” Bishop Flores said. The $100,000 raised by Catholic Extension for the new respite center is the latest grant in the organization’s more than 110 years of funding to the state of Texas. Catholic Extension’s historical funding of Texas totals more than $173 million when adjusted for inflation, including 1,860 church construction or renovation projects across the state. 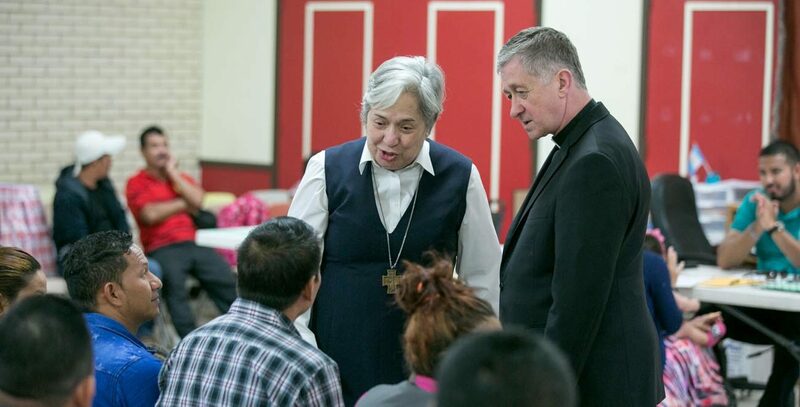 In addition to the funds for the respite center, Cardinal Cupich’s consistory dinner raised another $75,000 that was granted to Sacred Heart of Jesus Parish in Hidalgo, a rapidly growing parish located blocks from the U.S.-Mexico border. Cardinal Cupich personally presented those funds to the parish Aug. 15 as well, which are earmarked for the construction of a new church building. The work of the respite center in McAllen received national attention in September 2015, when Pope Francis acknowledged Sister Pimentel during a “virtual papal audience” at Sacred Heart Church televised nationally by ABC News. Cardinal Cupich and a delegation from Catholic Extension toured the current respite center, which is in the process of moving out of the parish hall and to an interim location while the new building is constructed. Today, the numbers of the people served by the respite center have greatly decreased, but it continues to welcome families traveling from their home countries in Central America who are escaping life-threatening situations. The three most-represented countries are still Guatemala, El Salvador and Honduras. In addition to attending to the physical needs of its guests, the respite center also provides phone services so asylum seekers can contact family members, as well as information on how to safely travel and live in the United States. Most refugees spend less than 24 hours at the center before boarding buses to reunite with their relatives and await their asylum court hearing. Cardinal Cupich praised the tireless work of Sister Pimentel and the numerous volunteers — including parishioners from Sacred Heart Church — who have staffed the respite center over the past three years. He stressed the need for the Catholic Church to extend a welcoming hand to the marginalized immigrant and refugee communities who pass through the center’s doors each day.